Stachel: It's the only one worth having. People respect it. von Klugermann: The medal, or the man? Since most war movies being released on DVD tend to focus on Vietnam or World War II, it's refreshing to find discs that center on World War I instead. That's particularly true when, like Lawrence of Arabia, they focus on a romanticized aspect of the war. This picture takes a look at the German air corps during the Great War, and the peculiar mindsets that were at work in that branch. On the Western Front in the last two years of the war (1916-18), the use of air power is coming into its own as brave young men in fragile biplanes engage in aerial combats laced with chivalry and death at a moment's notice. Lt. Bruno Stachel (George Peppard), apparently overcome by the romanticism of the air corps, transfers from the Army to join a unit under Captain Otto Heidemann (Karl Michael Vogler). The ace of the unit is Willi von Klugermann (Jeremy Kemp), a jovial but sardonic sort with whom Stachel engages in a friendly rivalry. Willi's uncle, General von Klugermann (James Mason) takes an interest in Stachel and promotes him as a national hero since, unlike other fliers, he is from the working class. But things are undone when Stachel becomes obsessed with winning the medal known as the Blue Max—signifying 20 confirmed kills in the air—to the point that he will betray Willi and claim several of Willi's kills as his own. Complicating matters is the affair that Stachel is having with the general's wife, Kaeti (Ursula Andress). The casting of Peppard seems slightly off-kilter here. Things aren't helped any by his refusal to even attempt a German accent, making him stick out among the cast; even Mason sporadically gives one a shot, though the results are not entirely convincing and make him seem of indeterminate ethnicity. Peppard generally just plays Stachel as an unemotional stiff, sleepwalking his way through the part. The actors playing the other German soldiers acquit themselves better, including character actor and frequent heavy Anton Diffring. It's through them, really, not through the nominal star, that the audience gets a clear sense of the dynamics of the corp, its focus on honor and chivalry, and the significance of the title medal. Andress is certainly fetching, particularly in period costume, and gives a passionate performance. I'd watch James Mason in just about anything, and phony accent or not he does a fine job here, conveying both duty and regret at having to fulfill his duties in a serious and convincing manner. The mood of the film is consistently bleak; the color scheme is almost nothing but grey and red. The skies always seem to be overcast and gloomy. The only time the visuals really come to life is during the dogfight sequences, and they are both frequent and exciting. The cockpit point-of-view shots are frequently dizzying and give the audience a feeling of entering into the picture. On the ground, the camera is active as well, using movement and focus to comment on the scene (particularly in the climax) without a word of dialogue. Although the running time is long, things move along at a good clip and the picture holds the viewer's interest well. The presentation incorporates the intermission music of the original release. If not for Peppard's lame performance, this would be highly recommended, but since he's in nearly every scene this can at best be considered worth a rental except for those who really like aerial dogfights. Image Transfer Review: The defects of early CinemaScope are readily visible in this anamorphic transfer; the distortion of the lens at the sides of the picture frequently makes people on the fringes look oddly squished, but this is a fault of the original film, not the transfer. The color is generally fine, although skin tones look a bit bluish on occasion. Shadow detail is generally plugged up and dense, and often darker sequences are hardly legible. The picture is clean and reasonably sharp, though aliasing is occasionally present, as is some minor ringing on the planes during the dogfight sequences. Audio Transfer Review: Fox provides a Dolby Surround mix for the English language track. Although dialogue is generally clear, and the fine Jerry Goldsmith score sounds great, there is at times a fairly prominent hiss. Explosions lack depth and presence for the most part. However, there is an excellent spatial clarity to the chatter of plane engines on the runways, giving a very good immediacy to these sequences. On the whole, this is a good use of what seem to have been somewhat marginal raw materials. Extras Review: The only extras of note are trailers. Three (in English, Spanish and Portuguese, identical but for subtitles and voiceovers) are for the feature itself, while five others are devoted to other pictures in the Fox War Classics series. Chaptering is thorough and the layer change is well-placed right at the intermission. 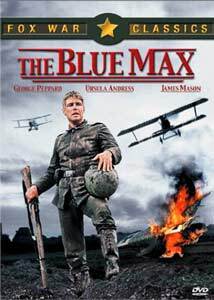 An interesting look at the German air corps during WWI, brought down by a lackluster lead performance by George Peppard. The transfer is a bit dark, and the audio is lacking in substance.